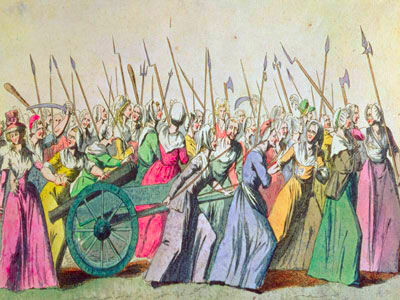 Subject: The 1789 Revolution and Fertility in France. This work is of great interest because it contradicts what we are constantly told by the growth lobby, the ABC, SBS, and the Murdoch and Fairfax Press. In clear historical terms the findings in this article, long accepted in France, contradict the so-called demographic transition, which says that populations reproduce to the maximum until they have completed industrialisation. France arrived at a steady state of population subsequent to the French Revolution and industrialisation had nothing to do with it. In my opinion the author's excellent historical demography is interpreted within a flawed paradigm, which is the notion of social and material progress as a some kind of chronologically programmed biological evolution for humans. Leaving that aside, this article is a rich resource which has, as far as I can see, been neglected since its publication by mainstream Anglophone demographic ‘theory’, presumably because it undermines the notion of overpopulation being inevitable and shows that a free people can run its own affairs without some overarching authority of centralised church or government. I translated this article because I could find no previous translations, although the author went to live in the United States where he was well known and wrote the piece (in French) from there. I could see its importance because the relationship between the revolution, population dynamics and localised self-government is the subject of my upcoming third book in the Demography, Territory Law series, which will be called: Land-tenure and the origins of democracy in France. Translation by Sheila Newman. Please cite if you are reproducing this work. The original French version was first published in Communications, 1986, pp.35-45, doi: 10.3406/comm.1986. 1653. http://www.persee.fr/doc/comm_0588-8018_1986_num_44_1_1653. Between the modern era and today, births and deaths in all developed countries have gone through a fundamental decline. This phenomenon has been called “the demographic transition” or “the demographic revolution”, by analogy with the industrial revolution, which represents in some ways the economic aspect of the series of parallel transformations which rocked the contemporary world. According to estimations based on a sample of parishes taken by the National Institute of Demographic Studies [l’Institut National d’Etudes Demographiques INED], the birth rate in France approached 40 births per 1000 people in the middle of the 17th century. This was a normal rate for a European country where marriages were late and life-long celibacy relatively widespread. Until the last quarter of the 20th century, the birth rate reached over 35 per 1000 in England or in Germany and it was not often much lower in Scandinavia. In the same era, it frequently exceeded 45 per 1000 in the countries of Eastern Europe as well as in the United States, where a different kind of marital pattern prevailed again. The French birth rate, however, slowed from the end of the 18th century. Soon after 1830, it went below 30 per 1000. We are looking at the emergence of a new reproductive system. This change in behaviour constitutes a preview of what is to come for the rest of Europe. But we will have to wait for nearly a century before another country undergoes a similar decline. At the end of the Old Regime French women had an average of over five children. Marriage age rose from the middle of the century, such that the birth rate slowly declined. After 1790, however, the birth rate suddenly fell abruptly. No-one disagrees that the fall in fertility at this time was due to the spread of contraception within marriage. The best proof is the shape of the statistical curves for legitimate births calculated from family reconstructions by demographic historians, notably Louis Henry and his colleagues at INED. Birth control manifests clearly in a behavioural constant indicating that couples who practised contraception were those who had reached a certain family size which they did not wish to go beyond. The term, ‘birth control’ should be taken seriously: we are not referring to spacing of births, but to stopping them. The fall in the birth rate in France, as elsewhere, was accompanied by a characteristic fertility pattern reflecting mothers’ age and length of marriage. Albeit that it is possible to identify on this basis the emergence of birth control among the privileged classes, like court nobles and some urban middle classes, the decline in the birth rate at the end of the 18th century was a phenomenon with such a wide social base that it could be seen at the national level. And, at that level, in the measure that it is possible to date with precision the intrusion of contraception in marital relations, a remarkable synchronicity appears between the demographic transition and the French Revolution. Because this result is so striking, we need to stop for a second to describe how it was obtained. The coincidence between the political revolution and the demographic revolution is too beautiful to be completely convincing. People have often tried to find a connection and to explain it in terms of attitudes and institutions: Challenging monarchical authority might have corresponded to a challenge to the idea of the family; the logic of the enlightenment might have overtaken reproductive matters, until then ruled by religion and tradition; the principles of liberty and self-government might have imposed themselves within couples as they did within the wider society… Didn’t Yves Blayo and Louis Henry, analysing their data, find a spectacular drop in mortality, possibly due to similar factors? Unfortunately INED’s sample is not detailed enough to reveal the state of legitimate fertility in all its regional diversity. Besides, the sample is taken from rural parishes, and the birth rate in towns was often lower than in the country. The survey is not representative at the department level, and the small numbers could play tricks at the parish level. The picture also loses some of its clarity at the beginning of the 19th century, for a number of reasons. To start with, the Revolution threw the civil registry (of births, deaths and marriages) into confusion, because it passed from the hands of the clergy to those of public servants, who were sometimes illiterate. Following this, the wars of the Revolution and Empire affected French demography, initially through the desire to avoid conscription, subsequently through the loss of young men impacting on the marriage rate. We cannot exclude transient effects on fertility in a period of crisis which were later statistically absorbed. It is therefore not surprising that the picture remains somewhat vague, and there is more work to do to bring it into focus. For example, the INED survey gives the impression of a population where there was progress in birth more or less everywhere at the end of the century. In contrast, the data published by Statistique de la France after 1800 reveal a fall in the birth rate still limited to Normandy and Aquitaine, without having spread into some regions where contraception was however apparent at the parish level. So, from 1800 we have access to data from the official civil registry, published in a rudimentary form. This data presents problems of interpretation: under-registration and difficulties in centralising information from thousands of communes, at a time when scribes used goose feathers, but, above all, the problem is lack of detail. We will have to wait for the very end of the century to have access to the age of mothers at the births of their children. On the other hand, legitimacy is noted from the beginning of the century: the data is taken down for legal rather than statistical purposes. Furthermore, the lack of detail for the civil registry is combined with an insufficiency of censuses. It is only from 1851 that published data categorises the population by age and by matrimonial status – essential information if one wishes to follow the evolution of marriage and to measure its effect on reproduction. Despite the limited information, analysis is possible. By combining the civil registry data and that of censuses, we can follow the evolution of fertility. Although these statistics do not give us the precise picture that we obtained from the reconstruction of families, they have the advantage of being much more accessible. They permit two essential tasks which were impossible for the period before 1800: study of the geographical distribution of fertility and of its decline, and that of its association with other characteristics - demographic, socio-economic or cultural – of the population. An initial level of analysis should allow us to tell the difference between the effect of marriage and that of legitimate fertility. These two effects are confused when we use a crude birth rate. According to the ideas of contemporaries (which included Malthus), it was the the proportion of celibate persons and the age of marriage which constituted the best method of adjusting the population to resources. Without the means to support a family, a person did not marry. However, birth control made it possible to deactivate the Malthusian trap, from the minute that passion between the sexes was not, as the English pastor thought, inexorably tied to uninterrupted production of babies. With the available data, we can follow by department trends in the proportions of unmarried and married women of different ages, and how those trends affect the potential fertility of the population. Fortunately, the contribution of illegitimate births to fertility is relatively small in general. Knowing the distribution of married women and the number of legitimate births, we can calculate a fertility rate for marriages that takes into account the effect of marriage. In order to do this, we asked how the number of births registered compared with the theoretical number that women would have had with the characteristic constant fertility of a population not using birth control. Using this principle, we calculated an indicator which expresses legitimate fertility according to that of the Hutterites, a population whose religion formally forbids contraception, and which has the highest fertility measured to date. In 1831, the first date for which we can use this indicator, there were seven departments where legitimate fertility was less than 40 per cent of that of the Hutterites: the Seine, which takes in Paris, Calvados, Eure and Oise, and three Valley of Garonne departments – Gironde, Lot-et-Garonne and Tarn-et-Garonne. In these regions the demographic transition was complete – or nearly complete. In Calvados, for example, the rate of legitimate fertility would hardly vary before the end of the century; it stabilised at a very low level for the times, but which, after other departments had completed their transition, would seem comparatively high. We may assume that the irreversible decline in fertility was already well in train at least fifty years earlier. While the aforementioned seven departments seem to lead the trend, the great reduction had already begun in half the departments of France. When a department went below 60% of the Hutterite fertility rate, one can no longer doubt that birth control is being used in most households. Map 1 shows how the levels of legitimate fertility as a percentage of the Hutterite one were distributed in 1831. In the family economy system that predominated then in western Europe, marriage constituted the best regulating mechanism. However, what most strikes us when studying the maps of legitimate fertility and marriage for 1831, is that one is practically the negative of the other. Where people marry late, reproductive behaviour has hardly changed. On the other hand, birth control has been introduced in regions where the marriage rate is the most intense. In this beginning of the 19th century, everything seems to indicate that the French limited births using two different strategies. Brittany fits into the category of departments where late marriage and celibacy dominated. Birth control is associated with early marriage in the region of Paris and in the Garonne valley. One notices some intermediate examples, like that of la Manche, which combined both strategies. 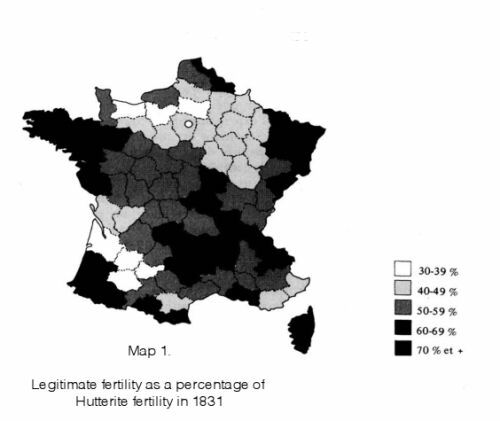 The inverse correlation between marriage and marital fertility is the most original characteristic of regional French demography in the 19th century, for the same phenomenon is generally not found in other European countries. A.Wrigley, the English demographer, has suggested that contraception would have replaced, in Rural France, the traditional method that adapted population to subsistence through fluctuations in the rate of marriage. Wrigley explained this new strategy could have come about because adjusting the marriage rate was suddenly insufficient in the face of what was required. The novel element was a decline in the death rate. In the 18th century, the age of marriage increased, along with the proportion of people who never married. But the decline in mortality became spectacular, and could have caused an unprecedented population increase. According to INED estimates, life expectancy at birth went from 25 to 40 years between 1740-1749 and 1830-1839 – an increase of 13 years since the Revolution! This was an exceptional decline in Europe. According to Wrigley, it was too rapid for the traditional adjustment via marriage to be effective. To use Jacques Dupâquier’s expression, marriage is a good accelerator, but a bad brake. One can put off the wedding when times are tough, but, once the marriage has been celebrated, the household has many reproductive years before the couple’s fertility runs its natural course. Birth control in extant marriages would have provided the solution that permitted disaster to be avoided. From then on, in regions where birth control in marriage had become practice, marriage need not be restrained. In fact, marriage age diminished constantly over the 19th century, especially in regions where birth control was strong. The proportion of people who remained unmarried for life declined everywhere. One can summarise the transition by saying that, very early, the French rejected a traditional morality that preached continence and celibacy, and opted for marriage. The sequence would thus be: decline in mortality, growth in population that could not be sufficiently curbed using the traditional methods as brakes; discovery of birth control; return to equilibrium between resources and population; intensification of marriage which no longer holds a plethora of children as its inevitable consequence. And, in fact, in 1831, the geographic relationship between the mortality rate and the natality rate was striking. The departments with a high life expectancy were generally the ones with a decline in fertility. But infant mortality remained high, and it still required three or four children per woman on average to maintain the population. Elsewhere, the regional diversity of fertility remained very high. Balzac seems to suggest abstinence as the means of preventing births. France, and rural France in particular, manifests through its numerical indices, not through its spokespersons. The big behavioural revolution takes place in secret, and its meaning escapes observers. Throughout the 19th century, the birth rate will basically be maintained at a level just sufficient to assure a constant population. In this period, France is distinguishable from all theother countries of Europe through the stagnation, even the decline of its rural population…. In 1841 already, the population of ten departments reached its historic maximum, before proceeding to a long decline. From 1851, half the departments had a negative growth rate. One cannot emphasise enough that the precocious adoption of birth control contributed to making France what it is today, a country with relatively low density compared to its neighbours. And because there were fewer men in excess in agriculture there than elsewhere, it kept its characteristic rural structure of small properties and relatively modest urban growth. The fertility transition was remarkably rapid in its beginnings, but it slowed for a moment in the middle of the century. After 1851, legitimate fertility stopped its decline nearly everywhere, and there was even a slight increase in nearly half the departments of France under the Second Empire. This increase is most marked in those departments where the decline was the least progressed. It is thus that fertility in the Brittany departments reached its highest level ever registered, at more than 80% of the Hutterite fertility rate. It turned out to be a rise before the definitive fall. When the decline began to accelerate again after 1876, this time it affected every department, except for Corsica, where fertility would not drop until after 1886. Thus there are two very clear phases in the French demographic transition. Before 1851, it was a rural phenomenon. The most prosperous departments seem to participate in it. One finds no relation at this time between industrialisation or urbanisation and [fertility] decline. Nonetheless Paris, whose legitimate fertility was less than 40% of that of the Hutterites at the 1817 census, is an exception. Furthermore the number of children born outside marriage in Paris compensates for the exceptionally low number born within marriage there. In general, illegitimate fertility seems to be tied to the proletariat of large cities, and increase in the north of the country with the development of the industrial revolution. France’s demographic transition’s second part began during the last quarter of the century. Although it was accompanied by a parallel decline in other European countries, which had not been the case before, this is what captures contemporary attention. The fact is that France had more than a century of population decline behind it, whereas its neighbours were only beginning theirs. Patrick Festy showed that fertility was still natural in every Western country around 1870. The net rate of French reproduction, however, was close to 1 from the time of the revolution. That is to say that the country maintained a fertility rate only just sufficient, taking mortality into account, to keep national population numbers at zero growth. But whilst up to 1870, most economists and Statistique de France, which up until then had been very impartial, congratulated themselves ‘on the French population’s sensibly circumspect attitude, after the Franco-Prussian war, the intelligentsia began to worry. The problem was that the fall in the birth rate seemed to be linked to the fall in France’s military strength. Today we know that the German birth rate had begun its decline, as was happening in most European countries, in the last part of the 19th century. This phenomenon was, however, hardly perceptible to contemporaries, and the differences between fertility levels remained considerable. The crude birth rate in Germany was still 35 births per 1000 inhabitants towards 1900, compared with 22 per 1000 for the whole of France. And the German rate was greater than the highest rate among French departments, that of Finistère, which was 30 per 1000. Marriage age remained high in Britanny. In Lot-et-Garonne, where fertility had not stopped dropping since the beginning of the 20th century, reaching 23 per cent of the Hutterite rate, the birth rate was 15 per 1000. The birth rate in more than half the departments in 1900 was not more than 20 per 1000. French reproductive behaviour was remarkably homogenous. Unexpectedly, due in part to their younger population, the birth rate of towns (with the exception of Paris) was higher than in the country. The birth rate at the beginning of the century was the result of a combination of the old Malthusian strategy of late marriage and the use of quite primitive contraceptive techniques. Around 1900, Jacqus Bertillon conducted a survey amongst doctors in a few departments with the aim of finding out how the French were limiting births. Withdrawal was foremost among the methods. Extraordinarily, it is today possible to measure the degree of use and the efficiency of contraception around 1901, due to a new technique of measuring starting from the distribution by age of legitimate births. The data for this has begun to be published in our era. With the appearance of birth control within marriage we see that the legitimate fertility curve tends to diverge systematically in relation to the age of the natural fertility curve. American demographer, A. Coale has suggested the indicator m to measure the strength of this systematic deviation. An m less than 0.2 corresponds to natural fertility; above 1.0 shows a high rate of birth control. The results of 1901 are shown on Map 2. The map of m is remarkably similar to the one showing levels of legitimate fertility, although it only shows the shape of the curve by age. The regions where contraception was still only weakly taken up in 1901 include before all others Celtic-speaking Britanny, the Massif Central, from Aveyron to Ardeche; the High Alps and the Savoy; and Corsica. Uptake was weak in a series of relatively industrialised departments, such as Bouches-du-Rhone, Vosges, Seine-Maritime, the North and Pas-de-Calais, and Seine-and-Oise. On the other hand, Garonne, from the Pyrennees to the Gironde estuary, are notable for the strongest use of contraception. In the agricultural departments Bertillon’s survey found the pursuit of a single child who would inherit all the paternal wealth taken to its extreme. In regard to this, Philippe Ariés would speak of human evaporation. France in 1901 was remarkable for the diversity of its regional compartments. The high fertility departments became lands of emigration. The industrial proletariat started to conquer birth control. Still on the demographic horizon was the Great War, which would confirm the fears of those who saw military defeat as a consequence of stopping population growth; the 1920 law that was going to try to forbid the dissemination of contraceptive information; and, finally, the homogenisation of behaviour within France and at the European level. Today France has one of the highest birth rates of Europe. However it is not so much that France has changed, but that others have followed its example. "the birth rate in France approached 40 births per 1000 people in the middle of the 17th century. This was a normal rate for a European country where marriages were late and life-long celibacy relatively widespread..."
Surely in the 17th century, there was little known about contraception, and "family planning" was more to to with high rates of infant mortality! of wetting a sponge with brandy to weaken the sperm. British birth control crusader Marie Stopes prescribed sponge s moistened with olive oil for 2,000 of her indigent patients she recorded no unintended pregnancies in the follow up visits. Infant mortality would have been high. Many legitimate and illegitimate infants were abandoned outside churches or foundling homes. Possibly one half of infants abandoned in France in the 18th century were abandoned by intact families. Wet-nursing was a particularly entrenched cultural phenomenon in France, where the wealthy sent their infants to the countryside to be suckled for several years by peasant women. A high death rate was common among these babies, probably due to neglect. There was higher infant mortality if a child was sent off to a wetnurse, because the wetnurse would typically malnourish the child, or feed it an oatmeal water, or watered down milk instead of her undiluted breast milk. In 17th century France, between 20 and 50 percent of all infants died within the first year after birth. This would have had a very high impact on population growth! The French Revolution began right at the end of the 18th Century, in 1789. Shortly prior to this the French were in a terrible situation of massive debts, in part due to financing wars, in part due to a huge investment bubble that bust (French India company, like the British East India company). The trade wars hotted up and Britain flooded french markets with cheap imported and manufactured goods after getting the French gov to make a disasterous agreement, abandoning protection for French workers. At the same time the RC church (which was just about the only one in town) exacted taxes on everyone and probably influenced a state of ignorance about birth control etc. The Revolution in 1789 changed all that. In the same year the State resumed the church, which became part of a secular public service. So a lot changed. Over the next few decades the ordinary French self-actualised and engaged like mad in a manner that probably woke them up for the first time in a long time. The article, which I translated due to its value, bases its argument on on quite good statistics that show that effective birth control was used by the French from soon after the Revolution until the State began to interfere in the late 19th century. If you disagree, then you need to argue against the statistical argument, based on Hutterite standard. The author has little info about the birth control but there is a lot of info elsewhere. The report takes into account infant mortality. In the 19th century, there were worker movements purveying contraception throughout the land and the state brought in laws to stop this. In 1998 or 99 I even met and interviewed in Paris the daughter of a woman who was imprisoned for distributing contraceptive info, and her father died in prison for the same 'crime'. I also have a film of her mother's 90th birthday, illustrated with a variety of viable contraceptives, which I am currently (slowly) subtitling. A reference is, Ronsin, F., La Greve aux ventres. With regard to infanticide, this is present in all societies, and particularly in poor urban societies where women were cut off from information about contraception and there are few alternatives, such as extended families, that could support a destitute woman. Sponges were not to be laughed at, apparently. We are taught to disrespect our ancestors and to respect dubious authorities, thus we lose an enormous amount of knowledge and power. , voluntarily ceased production in 1995. One of the reasons the company cited was that meeting increasingly stringent U.S. Food and Drug Administration (FDA) guidelines for its manufacture would be too costly (Leary, 1999). On April 22, 2005, the FDA approved the return of the Today Sponge to the U.S. market (Allendale Pharmaceuticals, 2005). the dead to prevent unintended pregnancy in the afterlife (Himes, 1963; Riddle, 1992). The “spermicides” they advised included honey, sodium carbonate, and crocodile dung (Suitters, 1967). By 1550 B.C.E., Egyptian women used cotton-lint tampons soaked in the fermented juice of acacia plants to prevent pregnancy (Himes, 1963)." Contraceptives have been available in many different forms in different societies. Often they were local contraceptives. The information was handed down mostly by women to women. That information was lost when rural societies were broken up by industrialisation and people who migrated to the towns in search of work lost connection with that information and there was probably a loss of birth control because of this. Hence the contraceptive movements among French workers. When the government interfered it became very difficult for women to access any information - I mean you could go to prison for trying to get info or for giving it out. This also happened in Australia, in NSW and Victoria, and was not rectified until the arrival of the pill and attempts by family planning clinics to reeducate women. In 1904 after the Royal Commission into the Decline in the Birth Rate in New South Wales (RCDBR) laws were brought in to (a) outlaw contraception and abortifacients (b) popularise pre-natal attendance and (c) encourage hospital births. This effectively broke women's networks and began the professionalisation and alienation of much that was once common knowledge maintained among women. I wrote a short history (about 17000 words as I recall) called Malthusianism, Neo-malthusianism and Women’s Rights in Australia, from 1770 to the 1990s in the late 1990s, which is how I know about this. There were copies around on the internet but can't locate any viable ones at the moment. Australian aborigines also used contraceptive plants. And if you do searches for 'local contraceptives' for various 'third world countries', you will find that they used to have contraceptives and that these have been checked for effectiveness. There is a lot to be found out if you go looking for answers rather than dismissing things out of hand because they run counter to what you have received as opinions. We totally underestimate our ancestors and thus lose our history and so much information and power. Mortality declined enormously with French Revolution, along with births, although marriages increased and celibacy decreased. "In short, the INED reconstitution of the French population involved a number of assumptions, estimations, manipulations, corrections, and adjustments, but the end result is internally consistent and logical. It shows that after a long period, when mortality rates fluctuated with no clear trend, a decisive improvement set in after 1789. The crude death rate, which had fluctuated in the mid-thirties from the 1750s through the 1780s, dropped abruptly below thirty per thousand in the late 1790s and dropped a second time, to the mid-twenties, once the wars ended in 1815 . Between the 1780s and the 1820s, female life expectancy at birth rose steadily from 28.1 years to 39.3 years. Although the wars make it impossible to calculate male life expectancy at birth from the 1790s through the 1810s, the male gain between the 1780s and the 1820s was similar to the female: from 27.5 years to 38.3 years. Although the decline in mortality was greatest for infants and children younger than 15 years of age, there was also a significant decline for adults up to age 65. The proportion surviving to age 15 increased from less than half to almost two-thirds for both males and females in the same period, and the proportion surviving to age 40 rose from barely more than a third to more than half. More than four million boys and girls born in France between 1790 and 1829 survived their first 15 years of life but would have died if the mortality rates of 1750 to 1789 had continued to prevail. Similarly, almost two million girls born in France in the later period survived to age 40 but would have died if the 1750-1789 mortality pattern had persisted after 1789. (35) These, then, are the striking facts that need to be explained by anyone seeking to fit French demographic data into the larger context of French history." (Extract from,Spagnoli, Paul G. "The unique decline of mortality in revolutionary France."